One occupant was found deceased inside a burned structure during the early morning hours last Thursday, Oct. 12. 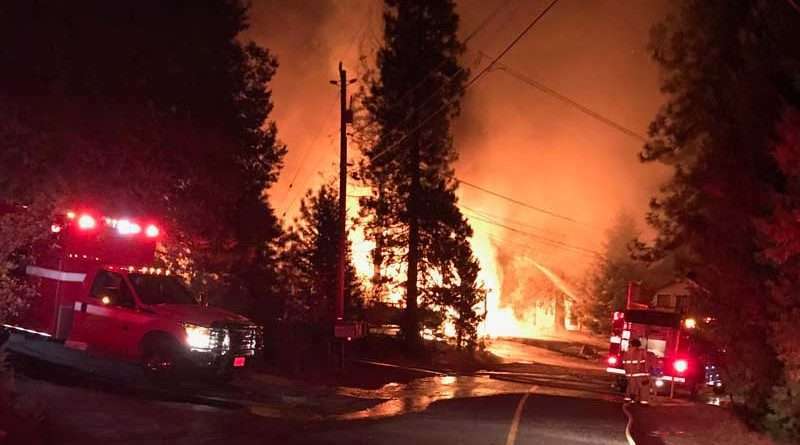 Units from Hamilton Branch and Peninsula fire departments and CalFire were dispatched to a residential structure fire at 3507 Cedar Lane in Hamilton Branch at 3:16 a.m. The initial report from dispatch was for a possible structure fire. The reporting party indicated they could see flames from across County Road A-13 and had heard a loud explosion from the same direction. Hamilton Branch Fire Engine 7321 was the first unit to arrive at the scene. Upon arrival, Engine 7321 reported one fully involved structure with fire spreading to surrounding trees and ground vegetation creating the threat of a wildland incident and also threatening other structures. The Incident Commander immediately requested additional fire units. Units from Almanor West Fire, Prattville Fire, Cal Fire, Westwood Fire and Clear Creek Fire were dispatched to the incident. Due to aggressive fire suppression tactics and the use of multiple heavy hose streams, fire crews stopped the spread of the fire to neighboring structures. The residence at 3507 Cedar Lane was a total loss. Several vehicles and small out-buildings were also destroyed. Part of the deck on a neighboring house was burned and one small spot fire approximately 200 yards from the main structure was quickly extinguished. Fire crews had the fire under control at 4:20 a.m. and that is when authorities found one occupant inside the burned structure and pronounced dead at the scene. Plumas County Sheriff Greg Hagwood said that he believes the remains are those of an adult male, but a DNA test will be performed to make a positive identification. His office is leading the investigation into the cause of the fire, which is undetermined at this time. Though Hagwood said foul play is not suspected. Anyone with information regarding the fire is encouraged to call the Hamilton Branch Fire District non-emergency number at 596-3458. Plumas County Sheriff’s deputies, PG&E and Turner Excavating assisted. Turner Excavating used its water tenders to wet down the surrounding vegetation areas and PG&E rendering inoperative a downed power line and rapidly restored electricity to neighboring residences. Great job on the part of the volunteer fire department in putting out this fire that could have easily destroyed other homes. We are lucky to have such a responsible Fire Department in Hamilton Branch. Condolences to the family.